Electrorad Digi-Line electric radiators provide a blend of traditional aesthetics and energy-efficient heating, offering a subtly styled system with energy-saving potential. Encompassing a range of single and double panel designs, the Digi-Line is adaptable and versatile - the perfect choice for your home, whatever your heating requirements. Electrorad radiators are easy to install with very basic DIY knowledge. For DIY installation, a plug will need to be purchased and attached to the cable, the radiators then screw to the wall and plug into a normal 13amp socket. Each radiator is supplied with wall plugs, screws, and a template to show you where to put the screws. All you need to do is attach a plug, drill four holes, mount the radiator on the bracket supplied, and plug into the nearest socket. If you do not wish to purchase a plug, or prefer a wireless finish, Electrorad radiators can be hardwired by a professional electrician. The Digi-Line Central Programmer can be fitted either freestanding or wall mounted: a straightforward DIY task. The programmer should be mounted in a dry location; it is not drip-proof or splash proof and should never be installed in a bathroom. 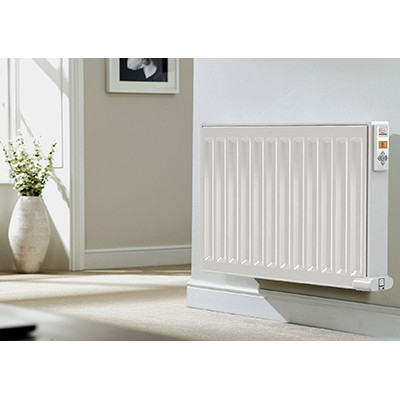 Electrorad Digi-Line Electric Radiators come with a 2 Year Manufacturer’s Warranty on the electronic components and a 10 Year Warranty on the radiator body. The Digi-Line Central Programmer comes with a 1 Year Guarantee. Digi-Line electric radiators are available with next working day delivery. Next working day delivery is available when you order before 11am (excluding weekends). Due to their weight, these items are delivered on a pallet. Pallet deliveries are charged at just £39.99 per order. This charge covers every item on your order, no matter how many items you purchase. All pallets are delivered roadside so please be aware you will need someone on hand to sign for the delivery and move the item into your property. To avoid injury, we strongly recommend having 2 or more people for the lifting. Electrorad Digi-Lines are energy efficient, traditional-style electric radiators that offer an eco-friendly and intelligent heating solution for your home. Digi-Line radiators maximise energy efficiency with the latest thermal fluid technology, a high-precision electronic thermostat, and full programmable heating control. Featuring innovative oil-filled cavities, which use efficient heating elements to warm the radiator surface rapidly and uniformly, Digi-Line electric radiators ensure an even heat distribution throughout your home, without hot or cold spots. The Digi-Lines’ central convection fins create the perfect balance of radiated and convected heat, warming you directly as well as warming the air. The radiators’ precision thermostats are accurate to within a tenth of a degree which means, with good insulation, the radiators only use power for a fraction of the time – creating energy saving potential. A maximum surface temperature of 60 ˚C, 75 ˚C or 90 ˚C can be set via the Digi-Lines’ lockable control panel. These updated, 2018 versions of the Digi-Line feature energy-saving open window detection and adaptive start functions. Open window detection allows the radiator to shut down whenever it senses an opened window, reducing wasted heat. Whereas adaptive start allows the Digi-Line to begin heating in advance of its schedule, ensuring it reaches optimum temperature precisely when it should. Double Panel Digi-Lines also come with smart control to reduce wasteful heating even further. If the Digi-Line detects the room is 1°C from your desired temperature, it will only engage the front panel for heating, rather than both panels. The second panel will only be activated if the radiator detects it is more than 1°C from your desired temperature. In this instance, the second panel acts as a temporary heat boost to quickly reach your desired temperature. This feature avoids unnecessary heating and ultimately saves energy. For advanced energy saving control, you can purchase your radiators with the Digi-Line Central Programmer. This device allows you to programme all your radiators from any location in the house, allowing you complete control over the temperature and timing of your electric heating. 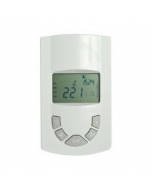 Use the programmer to set separate heating schedules for up to 4 zones, with a choice of 4 built-in heating programmes and 4 user-configurable programmes. Each programme can be adjusted in steps of only half an hour, giving you precision control over your heating. The timer and holiday mode functions give you the added scope to maintain your comfort whilst continuing to ensure maximum savings for minimum effort. The programmer uses a radio frequency to communicate with the receivers already built into Digi-Line radiators, so no wiring is required. The programmer is battery powered and can be installed freestanding or mounted on the wall – an easy DIY job. All programmes are saved in an EEPROM non-volatile computer memory so they will not be lost in the event of an ordinary power cut. The Electrorad Digi-Line range is mess-free, easy to maintain and very durable. The thermal fluid cannot freeze and is specifically designed to prevent internal corrosion. The radiators do not use a circulation pump or any other moving parts, ensuring that the radiator elements do not wear down. The traditional steel design of Digi-Line electric radiators makes them timeless additions to any home. They're eco-friendly too: made and designed in Britain with 100% recyclable fluid. Electrorad radiators do not come supplied with a plug, which means they will need to be hardwired by a professional electrician. For plug-in-and-go installation, a plug must be purchased and fitted to the cable. The radiators can then be mounted to the wall and plugged into the nearest socket. The central programmer can be used freestanding or can be easily mounted on the wall.